LOS ANGELES (KABC) -- The Los Angeles Police Department has named the officer who was off-duty when he fired his gun during an altercation with a teen in Orange County. Officer Kevin Ferguson was caught on video on Feb. 21 getting into a confrontation with a 13-year-old boy in the area of Euclid Street and Palais Road. 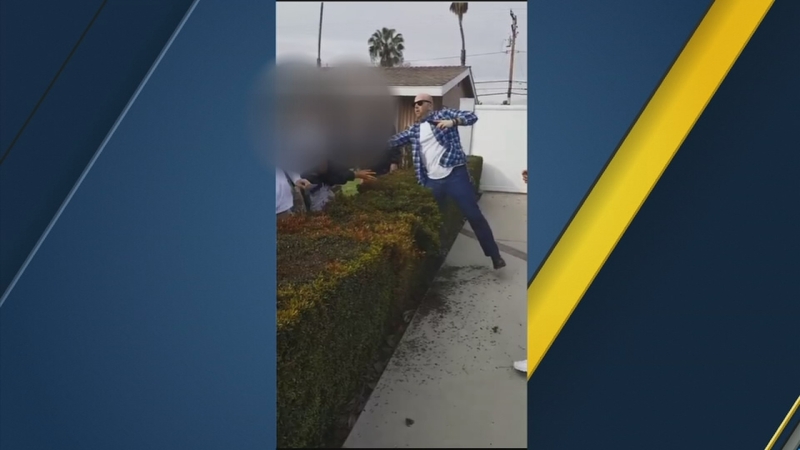 According to Anaheim police, the confrontation stemmed from ongoing issues with juveniles walking across the officer's property. The teen can be heard in videos of the incident claiming that the officer made an offensive comment to a female friend of his. The situation between the officer and the boy turned physical, with several other juveniles joining in, Anaheim police said. Video shows a teen pushing the officer, who falls over some bushes, but does not let go of the teenager. As more teens approached, the officer pulled his gun and fired once. No one was injured. A day after the video was released, hundreds of people in Anaheim took to the streets in protest of the officer's actions. Twenty-three people were arrested, including 18 adults and five juveniles. The LAPD is conducting its own independent investigation into the incident, while the Anaheim Police Department is conducting a separate one. The department will hand over the case to the Orange County District Attorney's Office to determine if any charges should be filed. Following the incident, the officer was placed on administrative leave, per protocol.